This is the type of album I might have picked up 10 years ago when I had a more open mind when it came to what type of rock I was willing to listen to. Honestly, had this album not been passed along to me, I would not have picked it up. I’m just not much of a fan of alternative rock/metal these days. Speaking of ten years ago, that’s exactly when this album sounds like it was made. 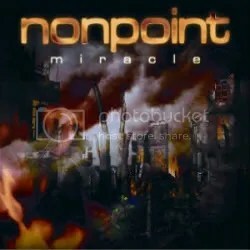 I have never followed Nonpoint’s career so I cannot compare Miracle to their previous albums but this sounds exactly like an album that could have come out in the late ’90s or early ’00s. That’s not necessarily a knock on the music, really depends on your musical tastes. I know I love it when a band like Scorpions or Ratt release an album that sounds similar to their earlier days so I’m sure longtime Nonpoint fans will not be disappointed by familiar chugging alt-metal riffs of Miracle. For my own tastes, Miracle actually turned out to be a decent album but it is the song “Miracle” that is the album’s superstar track. The only part of the song that I don’t care for is when Mudvayne/Hellyeah vocalist Chad Gray cameos and goes all nu-metal on us with some harsh vocals but other than that the song is good and was a fine choice as the lead single (the song got up to #22 on Billboard’s Mainstream Rock charts). “5 Minutes Away” is another top track. It’s a really catchy anthem full of the anger that the alternative metal scene is known for. Another song that deserves being singled out is “Dead Soul”. It is a hidden song that starts up about 9 minutes and 54 seconds into Track 12. It’s a piano-based ballad with a bluesy feel that I found myself really digging. I’m not sure why the band would choose to “hide” something so good, especially when it’s very unique compared to the rest of the album. Miracle is chock full of the heavy riffs and alt-metal anthems that it takes to get played on modern rock radio. Anyone that really enjoys alternative metal will probably enjoy this disc a lot and even as someone who isn’t the biggest fan of that genre, I can say there’s a couple of worthwhile moments on this album.